This press release contains forward-looking statements and forward-looking information (collectively, “forward-looking statements”) within the meaning of applicable Canadian and US securities legislation. 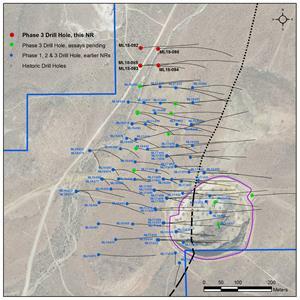 All statements, other than statements of historical fact, included herein, including, without limitation, statements regarding the potential use of proceeds from the offering, the advancement and development of our Mother Lode project and the expansion of our 2018 drill program; the full funding of the 2018 drill program as a result of the financing; updates on the development progress at the Mother Lode project; the potential for new deposits and expected increases in a system’s potential; anticipated content, commencement and cost of exploration programs, anticipated exploration program results, are forward-looking statements. Although the Company believes that such statements are reasonable, it can give no assurance that such expectations will prove to be correct. Forward-looking statements are typically identified by words such as: believe, expect, anticipate, intend, estimate, postulate and similar expressions, or are those, which, by their nature, refer to future events. The Company cautions investors that any forward-looking statements by the Company are not guarantees of future results or performance, and that actual results may differ materially from those in forward looking statements as a result of various factors, including, but not limited to, variations in the nature, quality and quantity of any mineral deposits that may be located,variations in the market price of any mineral products the Company may produce or plan to produce, the Company's inability to obtain any necessary permits, consents or authorizations required for its activities, the Company's inability to produce minerals from its properties successfully or profitably, to continue its projected growth, to raise the necessary capital or to be fully able to implement its business strategies, and other risks and uncertainties disclosed in the Company’s Annual Report on Form 10-K for the fiscal year ended May 31, 2017 filed with certain securities commissions in Canada and the Company’s most recent filings with the United States Securities and Exchange Commission (the “SEC”). All of the Company’s Canadian public disclosure filings in Canada may be accessed via www.sedar.comand filings with the SEC may be accessed via www.sec.gov and readers are urged to review these materials, including the technical reports filed with respect to the Company’s mineral properties.